Follow these steps to change, reset or recover a Windows Administrator Password in just several minutes. You may own an old PC that you’ve not used for a while and you may have forgotten the Administrator password. Or, like my friend below, you may have inherited an old computer and you need to use Administrator functions and you’ve never known the Administrator password so you need to hack it to get access to Administrator tools and utilities. Note that if you use this method to change the Administrator password, any previous administrator would no longer be able to log in with their old password because you’ve changed it. The method I describe is used to change an unknown Administrator password to something you know – or this method can elevate any windows user to administrator permission level. Time: 10 minutes to make boot disk. 10 minutes to follow screen prompts. It’s probably easiest if you create a bootable CD or Floppy disk. However, some newer computers support booting from a USB flash drive. Burn a bootable CD: Use a CD burning program, such as “Nero,” to write (burn) the .ISO file to a bootable CD, USB flash drive or floppy disk. Be sure to use the burn program’s option to make the target disk bootable. Tip: You must run this program from a bootable CD, USB drive or floppy as described in Part A. Part of the reason that this program can reset the Windows administrator password is because it boots your computer in a non-windows operating system, Linux, then it allows you to use the Linux boot to “Hack” the Windows Administrator password. Tip: I rarely read everything displayed on the screen. Read from the bottom up. See if you can understand the text displayed on the screen where the cursor is flashing. If you don’t completely understand, read from the bottom up until you do. Ignore the text that is confusing, and see if you can understand the task using the context of the text you do understand.The text will stop scrolling for a moment and “boot” will be displayed at the bottom of the screen. Press [Enter] or wait 60 seconds. Note in the second screen below that the Password Menu has a couple of useful options. The BEST approach would be to use the menu to ELEVATE some typical user to Administrator, then use the same method to clear that user’s password. 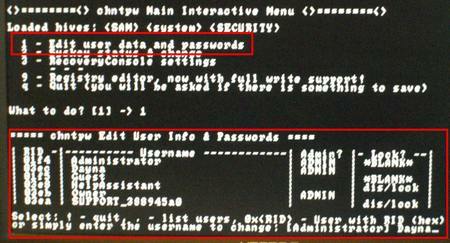 You’ll probably want to try this approach FIRST, before changing the Administrator password because if you make a mistake, then the Administrator password is still untouched and intact.Not that the user names and administration level is displayed in table on the Main Interactive Menu. Try option 3, “Promote user (make user an administrator)” before “hacking” the Windows Administrator account. Because if you make a mistake, you’ll likely still have other accounts to work with and the main administrator account will still be untouched. If you feel completely confident, you can select the Administrator account and select 1 to clear the Administrator password. Step 4: Quit the Interactive Menu. Save Changes. Quit The ProgramPress the exclamation point, then [Enter] to quit the Edit Password menu.Then press “q” to quit the Main Interactive Menu, as shown below. You will be asked “if there is something to save”. After completing step 4, remove the bootable CD and restart your computer. When Windows restarts, you should be able to access the Windows Administrator functions through the Windows account you altered. Prev How can I Wipe My Hard Drive clean before I give my Computer Away?